One of the "must-see" sections of the MJJCollectors.com web site is the impressive virtual collection of Michael Jackson Personal Belongings where you will find nearly 1,000 HIStoric memorabilia items owned and worn by Michael Jackson himself! Browse our online showcase and you will find artwork that was owned by Michael, Neverland furnishings, personal letters, official contracts, drawings, handwritten lyrics to some of Michael Jackson's most famous songs, and other belongings. 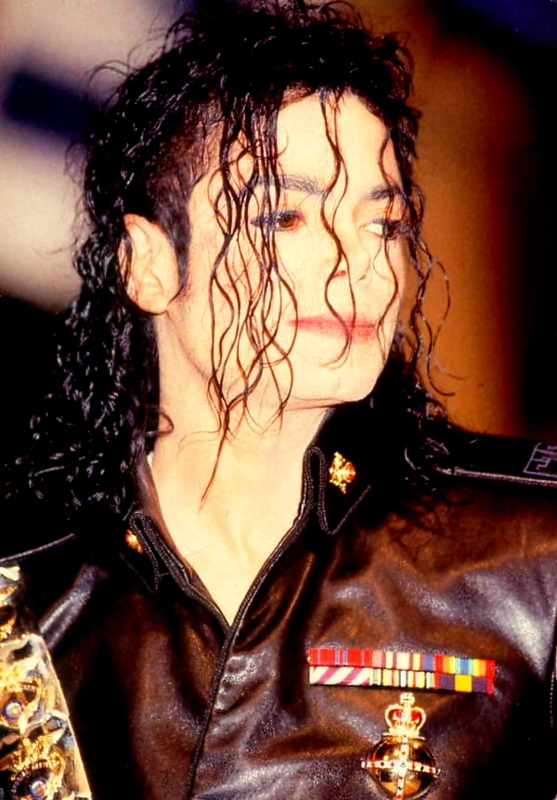 Among this section you will also find original awards presented directly to Michael Jackson including this 1995 MTV Music Award for the Scream Video and this 1984 American Music Award for "Beat It". You will also find an entire section of official RIAA record awards presented directly to Michael Jackson for certified sales of his multi-platinum albums. All of these rare memorabilia items are truly one of a kind collectibles. But without a doubt, the centerpiece of this section is the incredible array of clothing owned and worn by Michael Jackson. You will find this section broken down into ten categories: Accessories, Costumes, Gloves, Hats, Jackets, Pants, Shirts, Shoes, Socks, and Suits, each filled with personal clothing owned and worn by Michael Jackson, including many of the famous outfits he wore while performing on television, in concert, and on his videos. Accessories: If it's true that clothes make the man, then clothing accessories such as studded belts, dark or mirrored sunglasses, and custom jewelry make the man Michael Jackson. During The Jacksons' Destiny, Triumph, and Victory Tours, Michael's costumes and accessories were shiny and flashy, often covered with rhinestones like this belt worn on the 1979 Destiny Tour and this one worn on the 1984 Victory Tour. The Bad era saw a "tougher look" Michael, dominated by black leather and silver buckles such as this black leather belt (shown left) and this studded belt, both of which were worn on the 1987 "BAD" short film. Sunglasses were often part of Michael Jackson's costume accessories, both on stage and off. During the 1984 Victory Tour, the Jackson brothers took the stage wearing dark mirrored sunglasses, like this pair of gold medal sunglasses worn by Michael and this pair which were later gifted to friend Corey Feldman. Few Michael Jackson outfits were complete without being adorned with patches, medals, or jewelry such as a custom brooch. Michael also liked to collect certain types of jewelry or accessories to keep in his own private collection, like we get a glimpse of in the montage at the beginning of Moonwalker. We see a dressing room table filled with jeweled brooches such as this gold metal eagle, custom patches such as this one decorated in jewels with the "MJ" initials, and these gold fringed epaulets with white faceted stones. Many of the custom brooches in Michael's own collection were in the shape of a crown, such as this one with "MJJ" initials, this silver metal brooch, and this gold metal crown brooch. This custom made silver metal brooch features a peacock, which was used as the logo for The Jacksons up through their 1981 Triumph album and concert tour. Another favorite collectible of Michael's was vintage and elaborate military style medals such as this pair. Many of his "off stage" outfits up through the HIStory era featured military style jackets with medals, patches, and ribbons that he kept in his personal collection. Costumes: The stage costumes worn by Michael Jackson during his concert performances were every bit a part of his stage persona as his high falsetto singing voice and slick dance moves. Michael's wardrobe evolved throughout each period of his life and career, starting in the early 70's when The Jackson Five used vibrant "flower power" on this brightly colored ensemble first worn on the Goin' Back To Indiana TV special from 1971, this multicolor wrap with orange shirt, and this two-piece yellow and orange wool outfit with flower petal cuffs, all designed by Boyd Clopton. This hot pink stage costume jacket was worn by Michael on stage during the 1976 "Save The Children Rainbow PUSH Expo" while performing with The Jackson Five. Occasionally, The Jackson Five would select performance outfits made by costume manufacturers such as this black and white performance jumpsuit and jacket worn by Michael Jackson in 1975 and this orange stage outfit worn in 1974 on the Carol Burnett Show, both of which were designed by the International Costume Co. It was during the early 1970's that Michael began working with designer Bill Whitten who designed most of his stage costumes during the "Jacksons" tours up through the 1984 Victory Tour, including the famous rhinestone sequin glove. Whitten designed this orange and yellow costume first worn on "The Jackson Five" TV show from 1972 and these orange stage jumpsuits worn in 1976-77 during The Jacksons' first tour. The second leg of the 1979 Destiny Tour marked a sharp departure from the earlier concerts performed by The Jacksons in many ways. Prior to that point, the Jackson brothers often dressed in uniformity, which was the typical trend for many male groups of the 60's through the late 70's, perhaps traced back to their Motown roots with singing acts like The Temptations and The Four Tops. These consistent styles are exemplified in these blue and purple stage outfits worn in 1976 and these red stage costumes worn for "Shake Your Body" during the first leg of the 1979 Destiny Tour (shown above). Other outfits worn by The Jacksons during the first leg of the Destiny Tour are these silver suits and these marching band outfits. In 1979, Michael Jackson released "Off The Wall", his first solo album on Epic, and we start to see his individuality influence The Jacksons in the areas of music, dance, appearance, and fashion. The large afros the brothers had worn since signing with Motown in 1969 were replaced with shorter slicked back hair. Dance routines that were usually performed among the brothers in unison often gave way to Michael Jackson taking center stage, especially as he performed his smash hits from "Off The Wall" including "Rock With You", "Don't Stop Til You Get Enough", and "Working Day And Night". This is also about the time Michael began almost exclusively wearing the black penny loafers that became a staple of his wardrobe both on and off stage. Disco was still in its prime, and movies such as "Saturday Night Fever" were changing the way the younger generation looked, danced, and dressed. The debut of MTV in 1981 made music a visual medium like never before, and artists and the industry as a whole were looking for ways to capitalize on the new phenomenon. Michael Jackson wanted to be at the forefront of these trends, and he wanted to breathe new life into the stage fashions worn by The Jacksons as a starting point. Beginning with the second leg of the 1979 Destiny Tour, and lasting through the 1984 Victory Tour, each brother always wore unique attire, and Michael especially became known for his flashy outfits with shiny glitter and sequins such as this rhinestone mirrored costume worn on the second leg of the 1979 Destiny Tour and this white rhinestone stage costume worn on the 1981 Triumph Tour. This outfit from the opening of the Victory Tour features a rhinestone clad shirt with silver bugle beads down the chest and back and is signed "Love Michael Jackson", and this stage costume is comprised of white pants with crystal paillette pinstripes and a light blue shirt with rhinestone and crystal paillettes, both designed by Bill Whitten. The 1987 album "BAD" marked a tougher and edgier look for Michael, and it was through the beginning of his 25 year working relationship with costume designers Dennis Tompkins and Michael Bush that this style was developed. This black leather costume was worn during the 1987 BAD Tour in Japan and Australia, and this white jumpsuit was worn by Michael Jackson during the 1988 BAD World Tour for the "Working Day And Night" performance. Stage costumes for the subsequent Dangerous and HIStory Tours continued to evolve, reflective of the new songs that were released during this period, such as "Black or White" and "Earth Song". This jumpsuit was worn by Michael Jackson during the 1992 Dangerous Tour. Costumes during the HIStory era (both on stage and off) were often akin to a military soldier, such as this costume (complete with gold pants) from the opening of the HIStory Tour and these accompanying armor pieces. Following the HIStory Tour, Michael continued to perform in various venues including the 30th Anniversary Concerts in 2001 at Madison Square Garden and the Apollo Theater in 2002 where he wore this "Dangerous" performance costume. Gloves: Without a doubt, Michael Jackson's most recognizable trademark is the single white sequined glove. Michael actually started wearing a jeweled glove on one hand during the 1979 Destiny Tour as you see here and here. Yet it was the glove Michael Jackson wore during the "Billie Jean" performance from Motown 25 that made a permanent and indelible impression on the world. Throughout much of 1983 and 1984, Michael was often seen in public (on stage and off) wearing a similar white sequin glove, such as this white Swarovski glove worn during the Victory Tour (shown left), designed again by Bill Whitten. By contrast, this black Swarovski crystal glove was famously worn by Michael Jackson at the 1984 American Music Awards. For the 1987 BAD album and video, Michael wore these long black gloves (this time on both hands), and the single white glove was relegated exclusively to his on stage performances of "Billie Jean" going forward. During the Dangerous era, Michael began wearing a white "cast" arm brace in the Black Or White video and photoshoot, and on stage performances such as the Super Bowl. In 1994's HIStory trailer, Michael wore a similar white arm brace along with a black crystal glove. Among the Thriller era Whitten designed gloves is a set of eight colorful "Fantasy Gloves" that although were never publicly worn by Michael Jackson, were kept in his private collection inside a custom plexiglas display case at Neverland Valley Ranch. The gloves, such as this blue one and this gold one, were more colorful and elaborate than the single white rhinestone glove that Michael kept as his staple during his "Billie Jean" concert performances. Whitten also designed some of the gloves on the BAD Tour. Gloves that were worn during the Dangerous and HIStory Tours were designed by Tompkins & Bush, such as this white Swarovski glove worn during the 1987-88 BAD Tour and this one worn on the 1992 Dangerous Tour. In the beginning of Michael Jackson's Moonwalker film, we see a couple of other colorful gloves, this orange crystal glove and this blue crystal glove with silver stars, the latter of which was on display at the Los Angeles Grammy Museum until April 12th, 2009. During the HIStory Era, Michael commissioned this series of five crystal gloves that can be seen at the end credits of the 1997 "Ghosts" short film. Hats: In preparation for his Motown 25 performance, Michael asked his office to “Please order me a spy’s hat, like a cool fedora--something that a secret agent would wear.” That black fedora, worn during Michael Jackson's performance of "Billie Jean," became as much of his trademark as the single white glove. Beginning with the 1984 Victory Tour, he would wear the hat during the beginning and end of the song, and then throw it into the crowd as the finale. It was through this method that many of these "Billie Jean hats" found their way into the hands of fans and collectors, such as this one worn during the August 4th, 1984 Victory Tour at Madison Square Garden, and this one worn by Michael Jackson during his BAD Tour concert November 21st, 1988 in Los Angeles. Beginning with the BAD Tour, Michael wore a white fedora during the song "Smooth Criminal" such as this one which was worn on June 27th, 1992 during his Olympic Stadium performance in Munich Germany. Often these fedoras were gifted to close friends such as this hat which was given to dancer and choreographer Wade Robson and this one which is additionally signed "All My Love Michael Jackson 1998." Jackets: Our Memorabilia Showcase is filled with the instantly recognizable jackets Michael Jackson wore in concert, in his videos, and various public appearances such as awards shows. 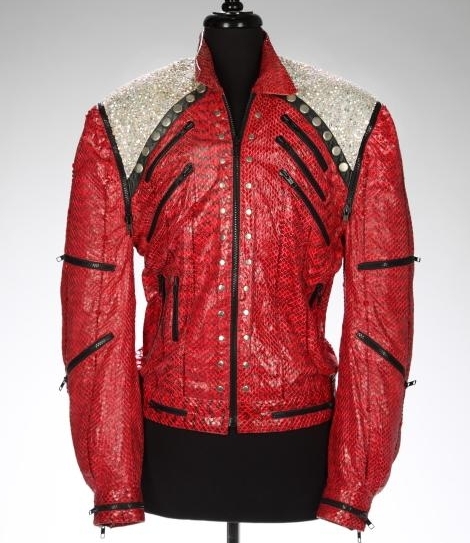 Among them is the red "Sergeant Pepper" style jacket he wore during the 1984 American Music Awards, the red leather zipper jacket from the Beat It video, the silver Jam jacket worn during the 1992 Dangerous Tour, and this iconic jacket worn by Michael Jackson in the "Thriller" video (shown left), which sold by Julien's Auctions for a record setting $1.8 million on June 25th, 2011! Perhaps the Thriller era produced the greatest number of memorable jackets, including this blue jacket with gold embroidery, this black crystal jacket with gold beads which was worn at the Hollywood Walk Of Fame ceremony, this black and white leather jacket worn on a 1984 Pepsi commercial, and this blue and red "Monroe" military style jacket worn at the famous 1983 Victory Tour Press Conference, which is also signed by Michael Jackson. There were numerous elaborate jackets worn during the 1984 Victory Tour, such as this turquoise brocade crystal jacket, this silver Lamé crystal jacket with gold beads, and this black sequined jacket worn by Michael for the ending finale of "Billie Jean" and "Shake Your Body." Pants: In this section you will find a selection of pants worn on stage including these rhinestone costume pants worn by Michael Jackson in the Rock With You video and second leg of the Jacksons' 1979 Destiny Tour (shown left). These white satin pants with criss-crossed rhinestones were worn by Michael Jackson on the Jacksons' 1981 Triumph Tour. And from the 1984 Victory Tour, you will find two very famous sets of pants including these striped bugle bead pants worn during a Beat It performance, and these black and white striped pants worn by Michael Jackson during the opening of many of the concerts. Shirts: Here you will find some of the iconic shirts that Michael Jackson wore during his famous videos including this Brazilian Olodum shirt worn on the 1996 "They Don't Care About Us" video, this orange long sleeve shirt worn during 1992's "Jam", this black long sleeve shirt worn during the 1991 "Black Or White" video, and this sleeveless "Amore" shirt worn on "Beat It". Included among the stage worn outfits are this silver spandex body suit worn during the BAD Tour and this gold fencing shirt and body suit worn during the opening of the Dangerous Tour, signed "Love Michael Jackson" on the front. And who can forget the attire from the 1984 Jacksons Victory Tour including this white silk shirt with rhinestone collar and this colorful blue and red sleeveless sequined shirt worn during Billie Jean, also signed by Michael Jackson (shown left). There are also several shirts from awards shows, such as this white shirt with rhinestones and black bow tie worn at the 1981 Academy Awards (which Michael attended with Brooke Shields), this red V-neck rhinestone sweater worn at the 1981 American Music Awards, and this white shirt with black arm band worn during his 1995 MTV Video Music Awards performance of "Black Or White". During the Dangerous era Michael Jackson was frequently seen wearing the "CTE" shirts designed for him by Tompkins & Bush such as this red one worn during a popular photoshoot. Shoes: No Michael Jackson stage outfit was complete without the black leather loafers like this pair (shown left), which allowed him to perfect his famous on stage dance moves such as the moonwalk. Equally as famous were these white and black leather shoes worn during the Moonwalker movie, and these original boots worn in Disney's 3-D Adventure "Captain EO" starring Michael Jackson. These black spat shoes were worn during his 1993 trip to South Africa where he was proclaimed as honorary "King of Sani". They are signed "Love Michael Jackson" on the right sole in black felt tip pen. Socks: On the concert stage, Michael Jackson would often wear sequin studded socks to match his gloves and other costume accessories. He wore these custom made rhinestone socks on the Jacksons 1981 Triumph Tour (shown left). During the 1984 Victory Tour, he wore these white sequin studded socks, which were donned in hand sewn Swarovski and square crystals, designed by Bill Whitten. These white crystal socks were worn by Michael Jackson on the 1992 Dangerous Tour. Suits: In this category you will find famous suits including the military outfit worn by Michael Jackson when he attended the 1986 American Music Awards with Elizabeth Taylor, this Italian Verri black suit worn in "Men In Black II", and, (shown left) this iconic white outfit worn on the cover of the Thriller album (baby tiger not included!). Special thanks to Julien's Auctions who provided several pictures via their auctions of rare Michael Jackson memorabilia, and to MJPhotosCollectors.com for additional photographs.